This phone is fairly called one of the smallest phones in the world. It is a little bit more than a usual cigarette lighter. 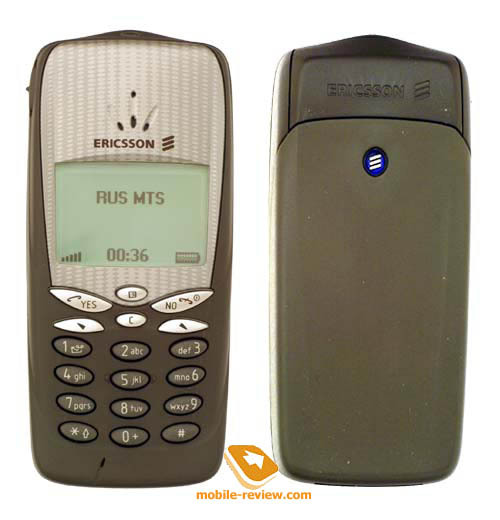 Often many consumers are mistaken thinking that engineers from Ericsson elaborated this phone. In reality they worked out only software (no doubts of this, look at the phone menu and its features). Hardware was worked out by MicroCell company as ODM supplier. This phone is really a tiny device, which isn't even seen in the hand, its dimensions are 92 x 42 x17.5 mm and the weight is only 59g. The phone design is made by traditions of Ericsson. The rim around the display can be made in different colours: silver or purple. Hence, the available colours of the phone are Silver supreme and Purple Passion. The remaining part of the phone is dark-brown in the first case and light-brown in the second. The functional keys are of the same colour as the whole phone. They are not large, have a convex form and spaced rather closely to each other. But, nevertheless, they are very handy and pleasing to touch. Unfortunately, the other keys (soft-keys, menu key and C), placed under the screen, are not so convenient. They are too small and hard to press, it's easy to confuse them with send key, for instance. But it was clear that such a small handset couldn't have had a handy keypad. The engineers did all their best to make it comfortable. The functional keys are comparable to the keys of larger phones by the convenience. The backlighting of the keys is bright and all the letters are highly visible at night. It's a pity but they are blended in the direct sun light, the font size is too small. The screen is not large either. But it can be sounded ambiguously here because some older models from Ericsson have a smaller screen, though a larger size. The display of T66 can show up to 4 text lines (16 characters each) and either 1 line with tips to the soft-keys or 1 line with a title. The display has a light-emitting diode green backlighting. (The backlighting of the phones, which are made by polymer technology, is usually emerald.) The backlighting of T66 is not very bright but it provides a comfortable work in darkness. An indicator light is almost not seen in the day light, but clearly visible in darkness. It's impossible to turn it off. A volume key is positioned on the left-hand side. Pressing it in the standby mode you can check a phone status: an approximate time of work, the date and the profile are displayed. When I firstly turned it on, I was very surprised - a presumable standby time was 3 hours though my battery was almost run out, but the phone really worked 3 hours and then it was switched off while incoming call. Manufacturers declared the phone could work up to 150 hours in the standby mode and up to 2.5 hours in the talk mode. In practice it worked 2 days in case of 20-25 minutes of talking. The phone has a lithium-ion battery of 570 mAh capacity which is hidden under the rear cover of the phone. The charging time is about 1 hour. A SIM-card holder is not usual here, though nothing interesting at first sight. 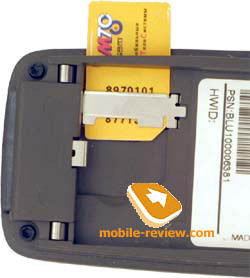 A SIM-card can be input only through the special side hole, otherwise, you can break it. A menu structure is traditional to Ericsson: there are several menus (bookmarks) with few submenus. To enter it you should press one of the arrow keys. Another way to access a menu is to use a shortcuts number navigation. You can also place your favourite functions to your Shortcuts to reach them quickly. Later to access this item you need only press a menu key. "C" key has one function, it sets the phone to silent mode. Let's turn on to the menu items description. Phonebook. It's not complicated: 250 phone numbers can be stored here. A search by name and cell location can be used. There is a speed dialing for the first 8 numbers (2-9). You can create caller groups, associate special ringing tones to up to 10 names. Here is all about opportunities of the phonebook but a common user doesn't need more. Messages. There are 10 templates, broad cast settings, EMS support, which doesn't work properly because of the old version. You can also create a message to a group of contacts, use Chat function and send concatenated (long) messages. Call info. Call lists are kept here: one list with all information about missed calls (up to 10 phone numbers) and the second list with incoming and outgoing calls (up to 20 phone numbers) and time and date indication. You can also check the duration of received and dialed calls and the time of the last call. Settings. The access to the main menu features is placed here. 16 pre-default ringing tones can be used as a calling alert. If you are not satisfied with them you can compose your own melody (up to 8) in the integrated editor. A vibrating, messages and alarm clock alert are set here too (any pre-default ringing tones). You can also turn on a minute minder, which will warn you about the coming minute. Profiles help you to personalize the phone according to your tastes. An interesting function - Automatic power of the profile, it connected with the organizer. When, for example, a Meeting comes, a specific profile turns on. Extra. Organizer is placed here. It has a monthly, weekly and daily view. To enter a specific day press a menu key and choose a day from the list. A temporary table with all events is displayed while viewing. The screen is not big and only minimum information is displayed, so you need to use scrolling. You can add several types of events (Meeting, Call, Reminder and Task), set a warning alert and an actual time. But I think that a usual alarm clock, which can be set at once or to the desired days of the week and which works when the phone is turned off, is more interesting to the common user. Besides, the phone has a countdown timer and a stopwatch with the capability to show intermediate results. There is a code memo and a calculator. The pre-loaded games are Pyramid, Smash (kind of Arachnoids) and Mill (logical game). WAP. WAP-browser 1.2.1 is installed here. As far as connection quality as concerned, the phone is standard. There are no problems, which such compact dimensions could have caused. The phone has a loud sound in a loud speaker. A real disadvantage is a remoteness of the microphone from the mouth, the other speaker can hear the noise sometimes. A volume of the calling alert is not sufficient. The phone can be heard only in quite places. 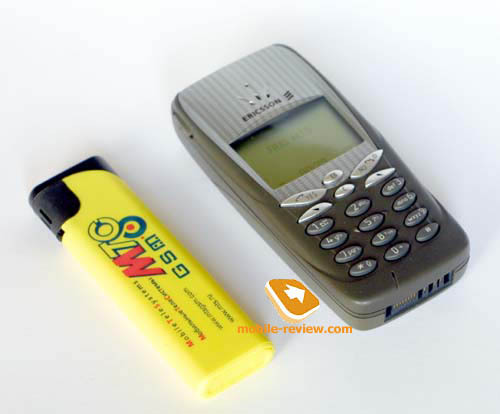 A vibrating alert is another weak point of the handset and it doesn't help in noisy places (the phone is too small). You should wear the phone only in the breast pocket, then you'll hear something, but the vibration is not good either. A fashion phone idea is realized in T66. The vast majority of my acquaintances were amazed by the dimensions of the handset. They were really impressed by the phone. The keypad is appeared handy. Of course, if to say about functions, it is not an advanced model, only a standard minimum is placed here, and it will be interesting to the small consumer group. It will be obtained by those people, who on the one hand would like to stand out and on the other - who don't demand much from the phone. It won't be also a good purchase for those who talk much, the phone should be recharged rather often, the battery works not long. I don't think that it really costs 240$. All accessories from Ericsson, demanded dynamic menu in the phone, are not suitable for T66 (for example, mp-3 player, FM radio and etc.). The SAR level is 0.85Watt/kg (10 grams) or 1.32 Watt/kg (1 gram). These figures are very close to the allowable one. It means that the power of receiver was raised to provide a better quality connection having such dimensions. But it's your choice. Nobody can guarantee 100% protection from the cellular phone affection.